A vanilla, sugar cookie sweetness to match the little faerie cakes Nana Crane used to bake for Dare and his sisters, a light chestnut flare for the coldness of the night that descends in the fall with a burst of berries and spice. I dare you not to try this tea. When a faerie child is born, the mystics look into their future and gift the child&apos;s parents with a name based on the deeds foreseen on their path. Dare&apos;s future promised to be riddled with challenges he simply could not refuse. 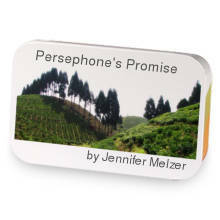 Dare Me Not has hooked up with Persephone's Promise. Love Dare Me Not? This is just one of 5 teas in this fandom. Check out the whole series.